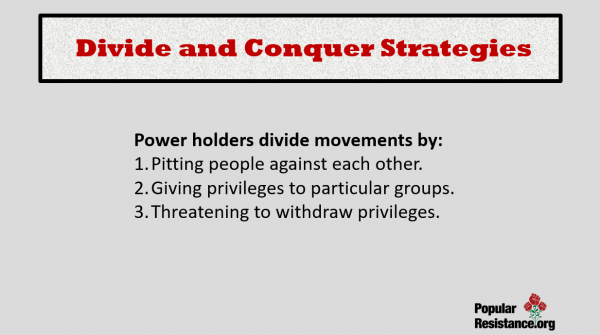 We review ways that movements are divided and taken off track, from intentional efforts to divide and conquer, as described by the corporate surveillance firm Stratfor, to co-optation, which can be insidious. 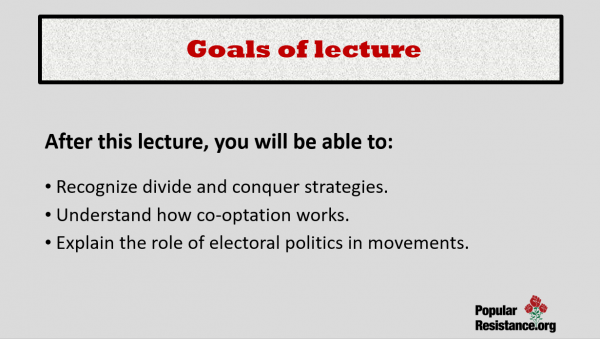 We also discuss the relationship between electoral work and movements. While its client work was noteworthy, the formula Duchin created to divide and conquer activist movements — a regurgitation of what he learned while working under the mentorship of Rafael Pagan — has stood the test of time. It is still employed to this day by Stratfor. The “idealist” is easier to deal with, according to Duchin’s analysis. 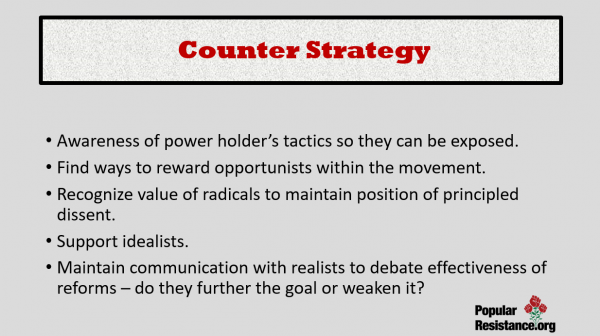 Duchin outlined a corresponding three-step strategy to “deal with” these four activist subtypes. First, isolate the radicals. Second, “cultivate” the idealists and “educate” them into becoming realists. And finally, co-opt the realists into agreeing with industry. “If your industry can successfully bring about these relationships, the credibility of the radicals will be lost and opportunists can be counted on to share in the final policy solution,” Duchin outlined in closing his speech. Alvin Biscoe passed away in 1998 and Jack Mongoven passed away in 2000. Just a few years later, MBD — now only Ronald Duchin and Jack’s son, Bartholomew or “Bart” — merged with Stratfor in 2003. “A typical dossier includes an organization’s historical background, biographical information on key personnel, funding sources, organizational structure and affiliations, and a ‘characterization’ of the organization aimed at identifying potential ways to co-opt or marginalize the organization’s impact on public policy debates,” the authors proceeded to explain. MBD’s “extensive files” on “forces for change” soon would morph into Stratfor’s “Global Intelligence Files” after the merger. What’s clear in sifting through the “Global Intelligence Files” documents, which were obtained by WikiLeaks as a result of Jeremy Hammond’s December 2011 hack of Stratfor, is that it was a marriage made in heaven for MBD and Stratfor. The “Duchin formula” has become a Stratfor mainstay, carried on by Bart Mongoven. Duchin passed away in 2010. 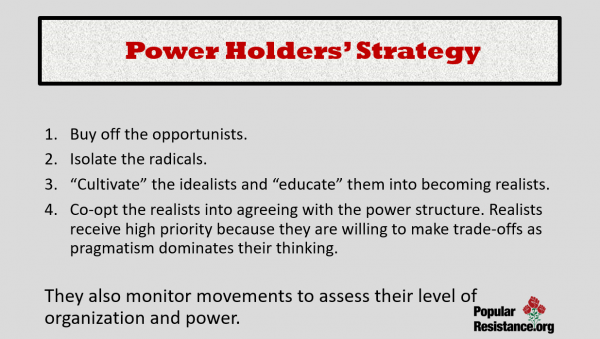 In a December 2010 PowerPoint presentation to the oil company Suncor on how best to “deal with” anti-Alberta tar sands activists, Bart Mongoven explains how to do so explicitly utilizing the “radicals, idealists, realists and opportunists” framework. In that presentation, he places the various environmental groups fighting against the tar sands in each category and concludes the presentation by explaining how Suncor can win the war against them. Bart Mongoven described the American Petroleum Institute as his “biggest client” in a January 2010 email exchange, lending explanation to his interest in environmental and energy issues. Mongoven also appears to have realized something was off about Chesapeake Energy’s financial support for the Sierra Club, judging by November 2009 email exchanges. It took “idealists” in the environmental movement a full 2 ½ years to realize the same thing, after Time magazine wrote a major investigation revealing the fiduciary relationship between one of the biggest shale gas “fracking” companies in the U.S. and one of the country’s biggest environmental groups. Bart Mongoven also used the “realist/idealist” paradigm to discuss climate change legislation’s chances for passage in a 2007 article on Stratfor’s website. And how best to deal with “radicals” like Julian Assange, founder and executive director of WikiLeaks, and whistleblower Bradley Manning, who gave WikiLeaks the U.S. State Department diplomatic cables, the Iraq and Afghanistan war logs and the “Collateral Murder” video? Bart Mongoven has a simple solution to “isolate” them, as suggested by Duchin’s formula. Indeed, the use of “trumped up charges” is often a way the U.S. government deals with radical activists, as demonstrated clearly during the days of the FBI’s Counter-Intelligence Program during the 1960s, as well as in modern-day Occupy movement-related cases in Cleveland and Chicago. Many of the alternative institutions founded in the 1970s and 1980s have been unable to sustain themselves over the long term due to a complex of factors. Increasing rationalization, routinization, centralization, and corporatism in U.S. social and economic life meant that community-based alternative institutions began their lives having to swim upstream against what was a decidedly swift social and economic current. George Ritzer (2000) has distilled these powerful currents into a representative one which he presciently calls “the McDonaldization of society.” Here efficiency and standardization reign as supreme values, shunting aside the particularized approaches of alternative movements and initiatives. As alternative approaches like neighborhood food banks, health centers, and community mediation centers increasingly cooperated with existing political institutions in the 1990s and gradually became more institutionalized, they also moderated their values, lost some of their community focus, and adapted their organizational structures. DiMaggio and Powell’s (1983) concept of coercive isomorphism is particularly apt here. Coercive isomorphism refers to the influential role of powerful exogenous institutions and resource providers, particularly the state, in fostering or imposing the reproduction of organizational patterns and values which reinforce the status quo. This review of the robust literature on cooptation underscores the multi-faceted nature of cooptation. 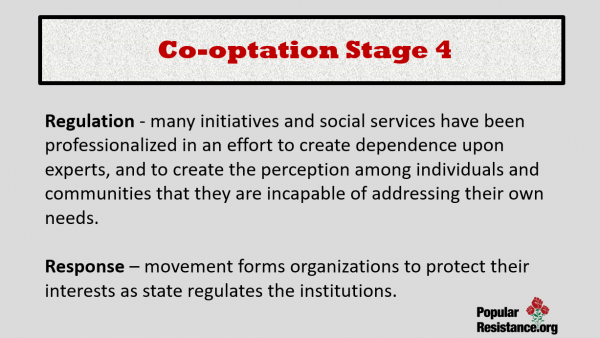 Thus, in what follows we have utilized a four-stage model to depict cooptation so as to bring some conceptual coherence to what is a complicated process of social interaction. In order to more fully understand the entire process it is helpful to break cooptation down into its key parts. These conceptually discrete aspects are called stages and steps in an overall stage model of cooptation. We emphasize, however, that each step in the stage model is actually a process, not an episode. No step, and certainly no stage, is a one-time event and none are accomplished in a specific moment or as a consequence of a particular action or event. The overall process and the progression between stages are depicted in our chart as somewhat linear. But in reality there are often loop-backs, mutually or unilaterally aborted processes, and both short term as well as extended periods without significant new developments. Such is the nature of all social interactions. Insofar as cooptation is a process, it is also important to understand that there is seldom a grand plan designed by the state and/or those vested in the status quo to lead a challenging movement step by step down the path of cooptation. We are not arguing that in the late 1970s reformers and influential allies in the justice system decided collectively—or even individually—to engage the mediation movement in a cooptive process that would eventually result in the political emasculation and moral diminishment of community mediation. Such comprehensive, integrated, and long-range grand plans are rare enough in policy circles; even more rare is their effective implementation. We do think it reasonable to assume, however, that an intention to coopt mediation has been present at various points on the part of various actors within the state and those invested in the status quo. To think otherwise is ahistorical with regard to the legacies of earlier challenging movements. In the section that immediately follows, we will describe each stage and step of the cooptation process that community mediation has undergone over the past 25 years. The first stage, inception, requires some context-setting. In the first step of Stage One, social movements like community mediation arise partly in response to a set of grievances or unfulfilled needs that a segment of the population experience in a shared way (McAdam 1982). Frequently, these grievances are framed as an “injustice” (Gamson 1992) and are thus used to help mobilize constituents and sympathetic bystanders to work for particular goals (Marwell and Oliver 1984). Two key variables that help translate social grievances into the collective action of a social movement are the development of shared consciousness and collective identities (Taylor and Whittier 1992; Johnson 1999) and the presence of political opportunities (Tarrow 1998; McAdam, Tarrow, Tilly 2001). Political opportunities are often present for challenging movements when events or broad social processes occur which undermine the assumptions on which the political status quo is reliant (McAdam 1982). Wars, riots, prolonged unemployment, political realignments, court decisions, governmental scandals and transitions all may present opportunities for movement mobilization. Political opportunities are present for varying lengths of time. Some are recognized by social movements and acted upon; others are missed, ignored, or deemed insufficient to mobilize around. Perception of opportunity is critical (Kurtzman 2003). Movements can also create additional opportunities, just as the civil rights movement and the peace movement helped create openings for the environmental movement. Political opportunity structures are not static nor are they confined to institutions; there are strong cultural components to political opportunities (Gamson and Meyer 1996; Polletta 2003). For example, a growing distrust in government gripped the U.S. in the early 1970s; cultural values, myths, and narratives that had previously gone largely unquestioned were critically scrutinized. This was due in part to the success of the civil rights movement, the Vietnam War, Watergate, widespread urban race riots, the excesses of the FBI in COINTELPRO, and the assassinations of JFK, MLK, and RFK. The loss of faith in the state combined with emergent collective identities and oppositional networks to contribute to the rise of widespread social mobilization, including the community mediation movement. A deep emotional dissatisfaction with government fused with a principled commitment to community-building. More specifically, mediation activists called into question the accessibility, responsiveness and fairness of the justice system. In the late 1970s, activists desiring changes in the justice system insisted that citizens needed—and in a democracy, deserved—access to more avenues by which to resolve their disputes than a court system dominated by legal professionals (Wahrhaftig 1982; Schwerin 1995). This demand for change is the second step in Stage One. There were two primary prongs to this movement: a reform initiative that hoped to humanize the courts by creating multi-door courthouses where citizens could avail themselves of a judge, an arbitrator or a mediator according to their needs (Sander 1976); and a more community-focused impetus that concentrated on creating alternative or parallel institutions of dispute resolution that would keep most citizens out of the courthouse entirely while also building conflict management skills in neighborhoods (Davis 1991; Shonholtz 1993). The creation of community mediation centers as a parallel institution represents the third step in Stage One. It is a significant step forward because it helps the movement gain legitimacy insofar as actually creating alternative systems unmistakably demonstrates a significant outlay of community support, volunteerism, and material and emotional resources for a fledgling movement. 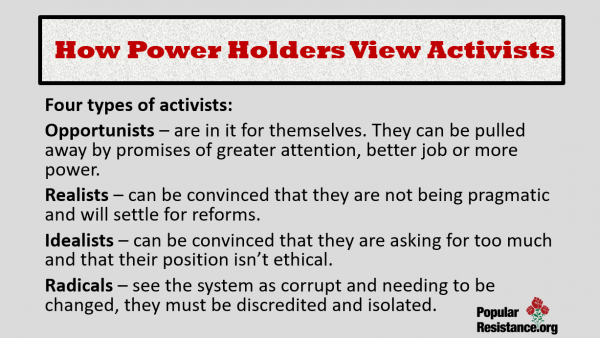 Setting up alternative systems is a shot across the bow of the state and vested interests (SVI), signaling that the challenging movement is serious and not easily ignored; power relations even begin to shift in substantive ways (Sharp 1973, p. 398-401; 414-416). The final step in Stage One occurs when various elements of the state and vested interests, responding to external and internal pressures, begin to perceive a need for policy adjustments or even reform. In acknowledging the need for changes, political elites are often motivated by a host of different reasons, including genuine support for the policy change, efficiency concerns, repaying political favors, political expediency, reelection concerns, or a desire to blunt the challenge and head-off more substantive changes. Of the many examples of this step present in the early years of the community mediation movement, we will mention three. The 1976 National Conference on the Causes of Popular Dissatisfaction with the Administration of Justice, commonly known as the Pound Conference, was convened by Supreme Court Justice Warren Burger to confront the crisis of confidence facing the court system. It spawned considerable debate about the justice system. There were still other insider allies for the nascent movement, including Attorney General Griffin Bell, who addressed issues of scale and costs in his call for change: “The traditional procedures of the courts are generally too slow and costly to be useful in resolving relatively minor disputes,” and thus, “the adversary process… is not always the best mechanism for resolving these disputes” (Bell 1978, p.320-1). Third, federal funding from the Law Enforcement Assistance Administration and the U.S. Department of Justice in the 1970s and 1980s to diversify the dispute resolution services offered and to support court-affiliated neighborhood justice centers is yet another expression of this final step in Stage One. The second stage of cooptation includes two steps, both marked by appropriation. In the first step the language and methods of the challenging movement are appropriated, while in the second step the work of movement actors may be appropriated through invitations to participate in policymaking. As noted previously, challenging movements often develop innovative/alternative processes to respond to perceived social problems. In the case of community dispute resolution, mediation and conciliation efforts were intended to empower the disputants, the volunteer service providers, and the community itself through programs administered outside the formal justice system (Coy and Hedeen 1998). The larger goals included improving the conflict resolution capacities of schools, churches, neighborhoods and social organizations while at the same time strengthening the role of the individual citizen in the exercise of democracy (Shonholtz 2000). Movement participants imagined a network of mediation programs where volunteer mediators would be peacemakers in their communities and help to reinvigorate the neighborhoods” (Beer 1986). A new language evolved through the practice of community dispute resolution, as efforts both within and without the governmental justice system refined their services. Terms familiar and new were invoked: intake, mediation, co-mediation, caucus, problem-solving. While the discourse and technique of community dispute resolution has become widely employed in court systems (see, e.g., Van Epps 2002, Hensler 2003), the movement behind the language has been discounted, quite literally. Speaking at the annual conference of the American Bar Association’s Section of Dispute Resolution in Seattle in 2002, Judge Wayne D. Brazil noted, “The term ‘movement’ in ‘ADR movement’ scares people” (Brazil 2002). While we suspect this fear has long been widespread in the legal community, it is seldom articulated, and almost never this explicitly. The concerns described so plainly by Judge Brazil demonstrate the general dismissal of community mediation’s social change agenda by the court system. The appropriation of terminology to represent similar practices with different goals is but one step in stage two of the cooptation process; the second phase of appropriation includes re-definition of those terms. In 1983, the Federal District Court for the Western District of Michigan adopted innovative rules for alternative dispute resolution processes. Local Rule 41 held that “[t]he judges of this District favor initiation of alternative formulas for resolving disputes, saving costs and time, and permitting the parties to utilize creativity in fashioning non-coercive settlements,” while Rule 42 provided for a nonbinding process in which a panel of three attorney-neutrals consider thirty-minute presentations from each party and return an evaluation of the case. This highly truncated process, which bears little resemblance to community-based mediation practices, is known as “Michigan mediation” (Plapinger and Stienstra 1996, p.158). It is particularly noteworthy that the Federal Court for the Eastern District of Michigan provides only fifteen minutes per party. This approach to mediation, which raises the specter of assembly-line justice” (Drake and Lewis 1988, p. 4), is antithetical to the values undergirding the community mediation movement. The emphasis on greater time-efficiency reflects broader social trends towards rationalization (Ritzer 2000), as well as narrower conceptions of the value of mediation. Alongside short turnaround times, referrals to mediation from various SVI channels, especially the courts, are tantamount to a simple disposal of the case (Harrington 1984). To attain settlements, many court-affiliated mediators employ “evaluative” approaches instead of “facilitative” ones (Riskin 1996), offering their assessments of disputants’ claims during mediation. Such directive activity is generally considered outside the bounds of community mediation practice (Beer 2003), yet “[u]ltimately, attorneys and the courts favor approaches to mediation that produce resolution—and mediator evaluation appears effective in reaching that goal” (Welsh 2004, p.591). Woolford and Ratner (2005) have persuasively argued that the hegemonic power of the legal system is such that the facilitative and transformative practices of community mediation will eventually “drift” toward the evaluative and directive approach to mediation that predominates within the legal system. In the early 1990s, the Ohio Commission On Dispute Resolution and Conflict Resolution (a state agency) gave Capitol University a $40,000 grant to produce a training video that promotes the “Seven Step Model of Mediation.” The irony of this model is that it is focused on a constant caucus or shuttle diplomacy approach to mediation, where the parties themselves seldom communicate directly. While most community mediation centers also employ a phase or step model of mediation, each step is theoretically geared toward empowerment and is based on direct communication between the parties. A more fundamental case of re-definition involves disputant participation in mediation. The voluntary nature of mediation is held to be fundamental to the process, as demonstrated by the prominent placement of self-determination as the first standard in the field’s most widely recognized code of ethics, the Model Standards of Conduct for Mediators (1998): “A mediator shall recognize that mediation is based on the principle of self-determination by the parties.” Even while community dispute resolution initiatives often suffered from low rates of usage (Beer 1986, Rogers 1992, Clarke et al. 1992), movement activists still placed considerable emphasis on the maintenance of voluntary participation in mediation. Yet coerced participation is the maxim of the justice system which values cost and time efficiency (Shonholtz 1984; Nicolau 1995). Coercion toward participation takes numerous forms, from the use of Request to Appear forms nearly indistinguishable from a court summons to invitations to mediation on the letterhead of the local prosecutor (McGillis 1998, Hedeen and Coy 2000); in some cases the letters are signed by a local official and conclude with the threatening line, “Failure to appear may result in the filing of criminal charges based on the above complaint” (McGillis and Mullen 1977, p.63). Other observers describe the appropriation of the community mediation movement’s language and technique more concisely: “A lot of folks love our methods and process, but don’t give a damn about our values” (Herrman 1995). One dimension of the appropriation of a social movement and its values is accomplished through various aspects of institutionalization. Murphree, Wright, and Ebaugh’s (1996, p. 452-460) research into a sustained but ultimately failed attempt to coopt community opposition to a toxic waste siting plan in Dayton, Texas has led them to identify three major components of cooptation, which they also see as “strategies used by coopting agents.” The three strategies (more properly conceived of as tactics) are: channeling, inclusion/participation, and salience control. We understand these three aspects to be closely interrelated and mutually reinforcing. Channeling refers to efforts by the dominant group to undermine and redirect the challenging movement’s leadership and power base away from substantive challenges to the dominant groups or system and toward more modest reforms. Opposition movements are channeled by formalizing communications and negotiations into orderly and reliable channels that are set up by and controlled in various degrees by state and vested interests. Centralized discussion and decision-making bodies are created where those vested in the status quo can concentrate their persuasion efforts to effectively neutralize key aspects of the challenge. For example, the Ohio state legislature created the Ohio Commission on Dispute Resolution and Conflict Management in 1983 in order to promote the diffusion of dispute resolution across multiple sectors of social, political, and economic life in the state. In the 1990s, the Commission funded a group called the Ohio Conflict Management Network. Membership included virtually any type of organization remotely connected with mediation in Ohio: state government employees, court mediators, social service agencies, religious groups and some community –based mediation programs. The commission supplied the facilitator, convened the meetings, and largely set the agenda. According to one participant, community mediation’s agenda was drowned in the sea of more powerful centrist interests (Joyce 2004). For example, one rule this broadly representative group adopted was that the Network could not engage in any lobbying or advocacy work, despite the fact that this was central to the work of many community mediation centers in the state. Similarly, in the 1980s the Supreme Judicial Court of Massachusetts established a statewide committee to monitor the quality of mediation. It was called the Standing Committee on Dispute Resolution. Albie Davis recalls that Rolfe Mayer, a German mediator, observed a number of these meetings and concluded, “Albie, now I see why they call it the Standing Committee. It isn’t going anywhere!” Davis further reports that, “Like much of the court system, our time was sucked up into a vacuum with no action” (Davis 2004). The second step is best represented by the actual participation of movement representatives on policy-making committees, state and local advisory bodies, institutionalized oversight agencies and boards, and in various schemes to design and implement new policies which are at best incrementally responsive to movement concerns. A proscribed number of movement activists are included in limited institutional decision-making and power-sharing. But while substantive power continues to be withheld, “responsibility” for administrative burdens of power is shared as movement leaders channel oppositional activities toward administrative functions (Murphree et.al. 1996. p. 452-453). In developing a uniform mediation law to obviate inter-state conflicts of laws, the National Council of Commissioners on Uniform State Laws and the American Bar Association Section of Dispute Resolution convened a drafting committee which included but one community mediation director on a committee of twenty individuals (NCCUSL 2001). Most efforts at social change that enjoy even partial success must include collaboration between the challenging movement and the state and vested interests. 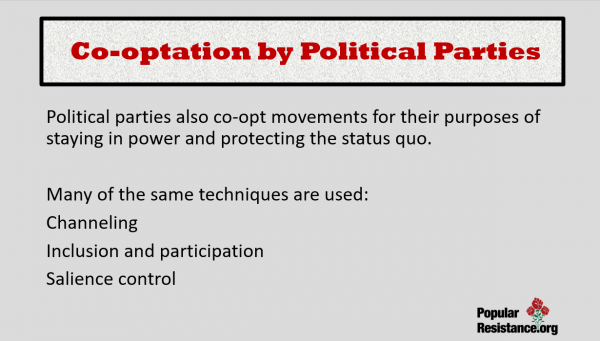 Cooptation is a social and political process that has multiple and often contradictory consequences; policy outcomes desired by challengers are sometimes accomplished and benefits may accrue to movements and their organizations through the cooptation process (Kriesberg 2003). If a movement is to achieve gains and solidify them—either incremental gains or more substantive ones—it will require participation in those policy-making bodies set up by the state and vested interests. That is why this step in our model (i.e. inclusion/participation) is one of the more ubiquitous aspects of the social and political cooptation process. Yet determining whether the inclusion and participation is a positive step forward for the movement’s long-range goals is a difficult and delicate task. The movement representative’s seat at the table and the voice that comes with it may partially transform the prevailing system and may modify power relations, but not always for very long or very deeply (Amy 1987; Mohavi 1996), and not without other costs to the movement or movement organization (Wondolleck, Manring, and Crowfoot 1990). One cost is the loss of the movement’s relative autonomy to create and maintain independent social and political spaces where critiques of status quo norms and policies may be nourished and articulated free from the conceptual constraints and boundaries of established thinking and existing policies (Melucci 1989; Woolford and Ratner 2003). Yet another is the siphoning off of emotional commitment and financial resources from alternative and parallel institutions that originated within the movement and whose establishment and maintenance consume significant amounts of movement energies. Other negative outcomes this aspect of the cooptation process have been shown to contribute to include movement sell outs (Murphree et al. 1996); the diffusing, disarming and channeling of oppositional forces (Szasz and Meuser 1997); minor concessions granted to delay major reforms (Coggins 2001); the diffusion of electoral accountability for policy choices (Rochon and Mazmanian 1993); the depoliticization of the issues and a concomitant demobilization of the movement (Mohavi 1996); the entrenchment of class and race disadvantages (Polkinghorn 2000; Varela 2001); and the preservation of state resources and capital accumulation (Hofrichter 1987). 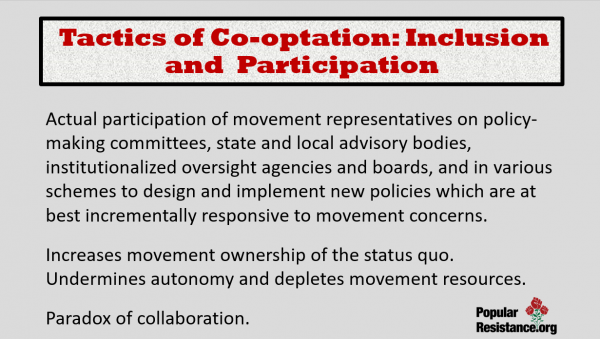 Still other costs to the movement result from what we call the “paradox of collaboration.” When a challenging movement gains entry into policy-making and oversight and implementation bodies, continued participation may become a goal in and of itself. Other movement objectives may be subsumed by the goal of ongoing access in the bodies that are beginning to regulate the partial policy changes that the movement has won. While the challenger movement may in theory abandon its hard-won seat at the table at any moment to return to other forms of contention, examples of this are relatively rare. The paradox of collaboration suggests that most members of the group will increasingly identify with the process due to their participation in it and that their “ownership” of the policy-making process and even of policy implementation will also increase. The inclusion/participation component of cooptation relies on a principle that is well known in conflict resolution theory and practice: that participation in decision-making and policy-making tends to increase ownership in the policies and decisions, even when the policies do not undergo substantive change and when the specific outcomes are not actually very satisfactory to the included participant (Carpenter and Kennedy 1988, p. 77-82, 102-105; Gray 1989, p. 21; Moore 1996, p. 144; Coy 2003; Mansbridge 2003). As members of a challenging movement participate on task forces, working groups, and policy roundtables that partially address some of the movement’s issues, the movement’s foci shift as its organizing energy is transferred from alternative initiatives and redirected toward the maintenance or at best the reform of established processes and institutions (Morrill 1998). 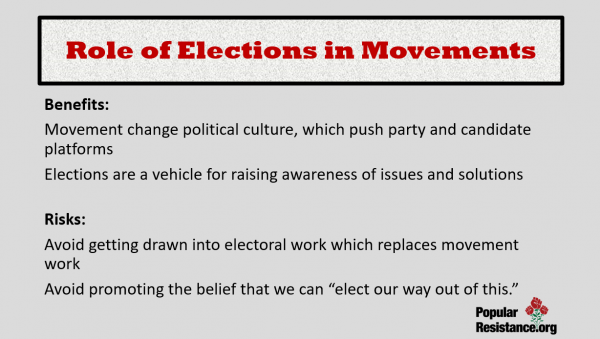 This participation, in turn, tends to increase movement ownership in the status quo. Thus it eventually blunts substantive movement challenges and contributes to the salience control aspect of cooptation. Salience control is closely related to channeling and inclusion/participation and is usually achieved partly as a result of them. Salience control has to do with shifting the motivational relevance that various issues or grievances have for movement activists. It refers to the “appeasement of group or organizational concerns over critical issues through the appearance that such concerns are being adequately addressed and, as a result, no longer need to be at the forefront of the group’s list of outstanding issues” (Murphree et al. 1996. p. 457). One consequence of salience control is that particular concerns eventually wane in priority for the challenging group, even though they have not, in fact, been adequately resolved. 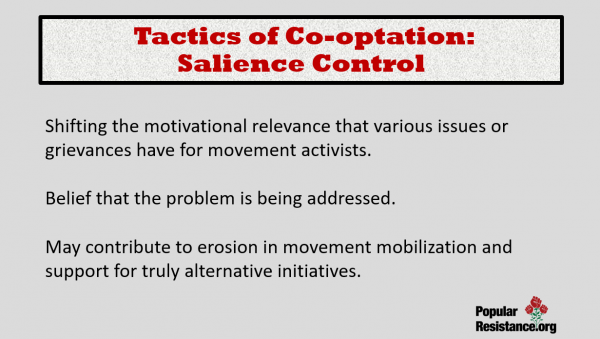 Salience control may contribute to erosion in movement mobilization and support for truly alternative initiatives. For example, Goldner’s (2001) research on the complimentary and alternative medicine movement in the U.S. shows that as activists in that movement gained entry and worked more closely with institutionalized medicine they changed their collective identity from an alternative movement to an integrative one. Here, as is so often the case with social movements, identity was contingent and movement activists and organizations were politically strategic about their definitions and deployments of collective identities (Coy and Woehrle 1996; Gamson 1996; Bernstein 1997; 2002; Maney, Woehrle and Coy 2005). In the process, however, while they saw specific alternative medicine techniques incorporated into traditional medicine practices, they also lost control of them and sacrificed the holistic ideology that had driven the movement and that under-girded the alternative techniques. As we noted above relative to community mediation, the articulated goals of many pioneering community dispute resolution projects included local empowerment through capacity-building, the redress of social ills and power imbalances, and the democratization of justice (Laue 1982, Wahrhaftig 1982, Davis 1991, Shonholtz 1993). However, these “dreams of justice, dreams of peace” (Beer 1986, p.203) have been scaled down considerably over the past quarter-century within community mediation, only to be replaced by more modest goals and measures (examined in our discussion of Stage Three). Like each of the other steps in this stage model, salience control is best thought of as a process. Thus, we will see below that salience control is also quite relevant in Stage 3b of the model, the assimilation of program goals. The final step in Stage 2b has to do with the legitimacy that the early stages of institutionalization bring to a challenging movement. As outsiders offering critiques of existing institution and policies, challenging movements need and desire credibility. This credibility can be intentionally created over time by the movement itself due to its discourse and actions (Coy and Woehrle 1996). It may also accrue to a challenging movement as a result of the institutionalization process; familiarity and inclusion minimally breeds acceptance and may also deliver respect. As mediation became increasingly institutionalized as part of the court system, community mediation centers willing to affiliate with the court system gained new levels of legitimacy, viability and resources. Many of the community mediation centers set up as alternatives to the courts have tended to be small, not well known in their communities, under-funded, largely reliant on volunteerism, and in need of case referrals (McGillis 1997). Increasing institutionalization with the court system has brought financial resources, more case referrals, a higher profile, and a certain kind of legitimacy (i.e. state-based). None of these developments are problematic in and of themselves. Indeed, many of them have made it possible for some threatened mediation centers to continue to operate and have helped other centers expand the range of services offered to their community (Honeyman 1995). Nonetheless, there are also costs to the individual centers and to the community mediation movement associated with these developments (Beer 1986; Drake and Lewis 1988; Phillips 1997). With limited support from a disproportionately-poor client base and only short-lived support from local, regional and national philanthropies, many community mediation programs have looked to the courts for funding. Davis’s evaluative report on community mediation in Massachusetts found that funding agencies have a profound impact on the shape and approach of individual programs, or in her phrase, “form often follows funding” (1986, p.35). This phenomenon is not limited to community mediation. As women’s organization secured government and corporate funding in the 1980s, “radical and alternative organizations became more mainstream as funders insisted on more bureaucratic and hierarchical structures” (Spalter-Roth and Schreiber 1995, p. 119). In a recent study of the robust voluntary and community sector in Northern Ireland, Birrell and Williamson argue that the even though the funding scheme there was set up to foster movement independence from the government, the result has still been that funding has “channeled the development of groups in certain directions,” including new directions that were not previously valued by the organizations (2001, p. 211). In a recent study of the influence that funding sources have on Mexican-American social movement organizations, Marquez found that they were greatly influenced by their dependence on external funding sources. This dependence altered the character of the organizations, redirected their programmatic priorities and brought about “far-reaching effect[s] on the contours of minority politics through the initiatives that are funded” (2003, p. 329-341). Similarly, Daniel Cress’ (1997) research on homeless social movement organizations in the U.S. found that those organizations that incorporated as non-profits in order to secure external resources also moderated their goals and their organizing tactics as a result. And as Douglas and Hartley’s (2004) analysis of drug courts found, unstable and unpredictable funding streams have led court administrators to adopt entrepreneurial approaches to finance their programs. The need to satisfy multiple masters with diverse interests has distracted administrators from long-range planning and ultimately risks the goals of the drug court reform movement. 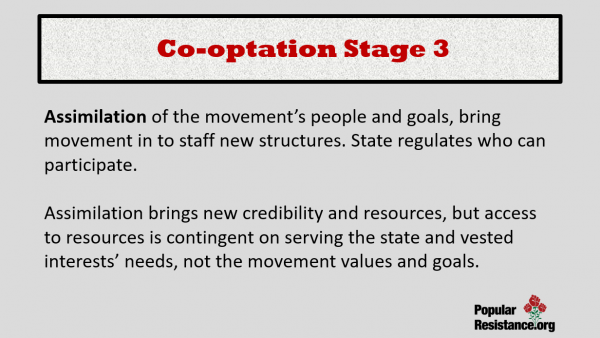 In Stage Three of the cooptation process, the state and vested interests assimilate both the individuals and goals of the challenging movement, making it hard for the movement to sustain its efforts. The prior stage involves the state’s appropriation of techniques and the participation of challenging movement figures in decision-making. This stage takes both actions to another level, as the state and vested interests develops or sponsors formal reform programs and then attracts movement leaders to staff these new institutional initiatives (Figure D). As documented earlier in this article, the institutionalization of community mediation began in the earliest days of the challenging movement. In the late 1970s Wahrhaftig (1982) developed a three-part taxonomy of programs based on sponsorship: justice system-sponsored, non-profit agency-sponsored, and community-based. While observing that any of these arrangements could deliver informal dispute resolution, he cautioned that “the political consequences of program sponsorship” (n.p.) require critical examination (see also Hedeen 2003). Practitioners working within the courts have openly questioned whether such institutionalization is the savior or saboteur of mediation (Press 1997). A recent study of justice system-connected programs in Florida has led to a new typology of approaches: assimilative, synergistic, and autonomous (Folger et al. 2001). The assimilative approach, which the authors argue has become the dominant one, has three distinguishing traits: “(1) practices that imbue mediation with the authority and formality of the courts, (2) the mapping of legal language onto mediation, and (3) an emphasis on case processing” (Folger et al. 2001, p.103). To the degree that such practices are indeed dominant, they serve to confirm the predictions of skeptical scholars writing in the late 1980s and early 1990s who held that community dispute resolution was little more than a veiled expansion of state control (Abel 1982), and that the formal legal system has “colonized” alternative dispute resolution (Menkel-Meadow 1991). Within small claims courts (“courts of limited jurisdiction”), juvenile justice offices, and family courts, it is not uncommon for service provision to shift from a referral-out or contract-out basis to an in-house operation, thus replacing and displacing community programs. “Quality assurance” and “program efficiency” are typical justifications, while the result is effectively a return to state control of the mediation resource. A second distinct step within stage 3a is employment of challenging movement leaders within the SVI structure. Many staff or volunteers of community mediation resources are hired by state agencies, often to coordinate statewide offices for the mediation resources or to direct formal governmental dispute resolution programs. These may include public policy dispute resolution agencies, family mediation offices, and court or juvenile justice mediation programs. While this transfer of staff may have positive gains for both the state agency and the challenging movement—as the state gains an experienced employee and the challenging movement gains a supportive resource person within the state—this also serves to remove seasoned, committed individuals from leadership roles within the challenging movement. The institutional capacity and memory that is lost through such a transaction is a setback for the movement. Many former staff members of community mediation centers have sought roles in more lucrative and stable positions due to household financial demands. As the directors of a Minnesota center so aptly and simply observed, “People have these jobs [in community mediation] because they can afford to have them.” Thus the loss of movement leadership, especially to the courts—where veteran mediators and dispute resolution administrators might utilize the same skill sets but for greater compensation and stability—is a trend likely to continue. Through the second step of Stage Three, state institutions play a powerful role in assisting and re-directing the efforts of both state and challenging movement programs (Hartley, Fish, and Beck 2003). Many states have governmental offices that support or coordinate community mediation efforts, including Hawaii, Maryland, Massachusetts, Michigan, New York, Ohio, and Virginia. These offices are typically linked to the courts and they often serve as regulating agencies; in many cases, they prescribe policies and guidelines, and monitor mediation operations through reports or site visits. Over time, such state offices frequently serve to transform the traditional goals and values of community mediation. Guidelines for training mediators are often administered by these offices, especially those regarding the required length and content of the training sessions. To qualify for some state funding, community mediation centers must employ only the services of volunteers trained through a state-certified training course. This routinization of training is a form of rationalization, through which both the training service and presumably, the mediation services provided by the individuals trained, will be consistent and predictable. Rationalization is also evidenced through a shift in program goals: the broader goals of community empowerment, relationship-building, and democratization of justice appear to have been set aside in the name of greater efficiency. Larger caseloads and shorter case processing times are preferred by the courts and other agencies, and a favorable disposition may be rewarded with more cases, more money, or other resources. The emphases on the quantity of cases handled and the celerity with which they are dispatched are complemented by an overriding interest in gaining resolutions. While mediation is often sold to disputants based on its numerous advantages including “its ability to constructively address conflicts, respect each party’s perspective, empower individuals to take personal responsibility for conflicted relations, establish mutually beneficial dialogue, and reduce violence” (Hedeen and Coy 2000), attaining agreements too often becomes the limited measure of success. When programs are designed to deliver agreements (or rewarded for agreements), mediators may pressure disputants in ways that compromise disputant self-determination: “Mediators remind recalcitrant disputants that if they don’t come to agreement, the court may hold it against them” (Beer 1986, p.212). Efficiency is the established and accepted goal of mediation in many venues. In small claims courts, where community mediation volunteers are often employed, a Department of Justice report listed the five goals of a mediation program: (1) Increasing the efficiency of case processing; (2) Reducing court system costs; (3) Allowing judges to provide added attention to cases on the regular civil docket; (4) Improving the quality of justice; and (5) Improving collection of judgments (DeJong 1983). In Stage 2a above, the issue of time-efficiency was evidenced by twenty-minute mediations (Drake and Lewis 1988), as well as an emphasis on short case turnaround time (McGillis 1997). Research reports on court-based mediation have demonstrated the high proportion of settlements in mediated cases (Wissler 2002; Woolford and Ratner 2005) and greater durability of agreements (McEwen and Maiman 1984), both measures indicating a low likelihood of these matters returning to court. That these have become widely-accepted indicators of mediation success represents a continuation of the process of salience control (Murphree et al. 1996) addressed above: the valuation of case numbers and outcomes over community capacity building and respectful processes reflects a shift in community mediation. These are manifestations of DiMaggio and Powell’s coercive isomorphism, introduced earlier in this article. They also parallel Morrill and McKee’s (1993) research findings at a community mediation center in the Southwest, where they documented the organization’s survival strategy to be a transformation away from “community improvement” and “personal growth” goals and toward the processing of court and agency referrals, and the funding, caseload and legitimacy attached to such referrals. One goal of many challenging movements is a desire to achieve administrative rules or to enact laws that will mandate and codify some of the platforms and values of the challenging movement. At their best, such outcomes, like the Civil Rights Act of 1964 or the Clean Water Act of 1972 for example, represent a clear, albeit partial success for challenging movements. But in many cases, codification and the regulations that invariably follow are not necessarily a positive outcome for the challenging movement. The Uniform Mediation Act is a case in point. As mentioned previously, the National Council of Commissioners on Uniform State Laws, in collaboration with the American Bar Association’s Section of Dispute Resolution, drafted the Uniform Mediation Act (UMA) in 2001 and amended it in 2003. By the autumn of 2004, the UMA had been adopted in two states (Illinois and Nebraska, with modifications) and legislation had been introduced in seven others and the District of Columbia. It is the first nation-wide attempt to regulate aspects of the practice of mediation. As such, the National Association of Community Mediation is strongly and actively opposing the UMA because of its perceived likelihood to erode the independence of community mediation centers, because it weakens the confidentiality and evidentiary privileges that mediators and participants in mediation have with respect to later legal proceedings, and because its universality is perceived to “weaken the opportunity for more appropriate and culturally sensitive forms of justice and adversely affects the creativity and potential growth of mediation” (NAFCM 2003). The cooptation of a community-based initiative like community mediation is made more likely by widespread pressures to professionalize various social services, including the practice of dispute resolution. McKnight (1995) argues that many initiatives and social services have been professionalized in an effort to create dependence upon experts, and to create the perception among individuals and communities that they are incapable of addressing their own needs. Paralleling Auerbach’s view (1983) that both justice and dispute resolution have been ‘legalized’—that is, appropriated away from individuals and codified into formal law—McKnight’s thesis of professionalization helps explain why many community mediation centers have not been able to generate sustainable case loads of funding levels independent of the court system. Although the formal regulation of mediation on the state level is not yet widespread, the practice of mediation is increasingly regulated in a variety of ways in some states (Hartley, Fish, and Beck 2003). For example, Virginia established a regulatory agency in 1991, the Department of Dispute Resolution, whose mandate includes establishing and overseeing certification requirements for all court-referred cases in the state. While professional associations have adopted policies to the contrary (even including the American Bar Association), some states now have laws or rules that restrict the practice of court-affiliated mediation to those with law degrees (e.g. Florida). In addition, some states require a bachelor’s degree for mediators affiliated with district and circuit courts (e.g. Virginia), and some states now require the same for local courts. Melinda Smith, former co-chair of NAFCM, metaphorically refers to this regulatory practice as “pulling up the ladder.” A trend may be emerging: higher educational thresholds and more restrictive mediator certifications. Yet community mediation has always relied upon mediators who are drawn from the general community and are often volunteers. Most community mediation centers are committed to building pools of trained mediators that are reflective of the community’s diversity, and many are increasingly meeting this commitment. State regulations that require advanced degrees or law degrees are in direct opposition to this principle (Pipkin and Rifkin 1984). The Individuals with Disabilities Education Act was originally signed into federal law in 1975 to ensure that children with disabilities had access to education and educational services. It was substantially amended in 1997 to include the governing of special education mediation practice. The Act now mandates that only solo mediation may be practiced with disputants who are protected by the Act. Such a restriction is contrary to the practice of community mediation which has increasingly tended toward 1) the use of co-mediators in order to be responsive to gender, ethnic, age, and power differences between disputants; 2) using either solo mediators or co-mediators according to whichever is deemed more culturally appropriate for the particular mediation. The increasing codification and regulation of mediation houses a peculiar irony. After all, one of the originating goals of community mediation was to set citizens free from some of the limitations of law and from the rigidities of formal legal institutions with regard to how they manage their conflicts (Menkel-Meadow 1991). Yet this irony runs much deeper than it first appears to. For as mediation and other forms of alternative dispute resolution have become more commonplace in some court systems, lawyers still operating out of an adversarial model employ mediation and other ADR mechanisms “not for the accomplishment of a ‘better’ result, but as another weapon in the adversarial arsenal to manipulate time, methods of discovery, and rules of procedure for perceived client advantage” (Menkel-Meadow 1991, p. 1). This has contributed, in turn, to many issues associated with the practice of court-affiliated mediation being litigated, meaning that case and statutory law about mediation is now being developed, including a jurisprudence about mediation and ADR. The practice of mediation and the ways and manners of which individual citizens may avail themselves of it are increasingly proscribed. When the cooptation of a challenging movement engages the stage of codification and regulation, the movement and some of its organizations may adopt reactive strategies and defensive measures to protect the integrity of the movement’s alternative institutions, practices and cultures. The Ohio Community Mediation Association (OCMA), for example, was formed in May 2002. It consists of fifteen community mediation centers throughout Ohio and its mandate is to represent the interests of community mediation centers in the policy-making process in Ohio. Among the OCMA’s core beliefs and values are ones that are deeply reflective of the values that originally spawned the community mediation movement, that is, to be agents of change by intentionally addressing social justice issues in their work, responding to the needs of the entire community, advocating for collaborative, inclusive and fair processes in the community, ensuring open access to conflict resolution services, and adhering to self determination such that the community determines and defines what quality mediation is for their community. When the Uniform Mediation Act was introduced into the Ohio House of Representatives in 2003, the OCMA spearheaded opposition to the Act through a partially successful statewide lobbying campaign that has delayed the progress of the legislation and which continues to try to win modifications in the legislation (Joyce 2004). In their useful analysis of the institutionalizing of restorative justice in British Columbia, Woolford and Ratner effectively argue that cooptation and colonization in that context is not a “necessary outcome” (2003, p. 189). We are of the same mind with regard to social movements and cooptive processes in general, and the community mediation movement in the U.S. in particular. The social dynamics of cooptation are not made up of some inexorable force progressing toward a pre-ordained and complete coopting of challenging movements. Such a view does a disservice to the nature and power of social movement challenges to the status quo, driven as they often are by shared identities and deeply-held values and visions that movement activists are often convinced will bring about a better, more just and humane world (Melucci 1989). Thus, even in the face of substantial degrees of overall movement cooptation, there will long remain practical exemplars of the values and ideals that originally drove a challenging movement. That is certainly the case for the community mediation movement. In all cases, there are degrees of accommodation and cooptation. Many mediation centers engage in creative relationships with the formalized legal system, using the revenues generated from court-referred mediation cases to provide free access to dispute resolution services and conflict management skills training to schools and community groups. Research on a broad range of peace and environmental groups demonstrates that challenging movements that eschew partnerships and working relationships with the state and with the systems and structures that they are trying to change do not fare well over the long term (Zisk 1992). Similarly, Woolford and Ratner persuasively argue that the restorative justice movement in British Columbia must be a nomad, occupying an “oscillating space,” one not located entirely within or outside the legal system and where strategic interventions in the legal system are combined with the maintenance of relative degrees of independence from the system’s hegemonic forces (2003, p. 188). As we have amply demonstrated above, occupying and maintaining an oscillating space vis a vis the formal legal system is no small feat for the community mediation movement as a whole, or for specific centers. Those working in the field of community mediation face a plethora of pressures, including funding, volunteer recruitment and retention, training, community support, and maintaining independence. While some of these pressures can be creatively reconfigured in a complementary fashion, many more are contradictory. In either event, particular decisions or actions are too often considered out of context, such that the larger ramifications and long-term meanings are not readily apparent. Precisely how, then, might community mediation centers maintain this oscillating space? What ought they to do? While we do not pretend to know the answers, we are quite sure that for movement activists to have as full of an understanding of the processes of cooptation as possible is an important part of the answer. The is is usually parent to the ought. Put another way, an accurate description of a social problem is a prerequisite to an adequate prescription (Maguire 1979). 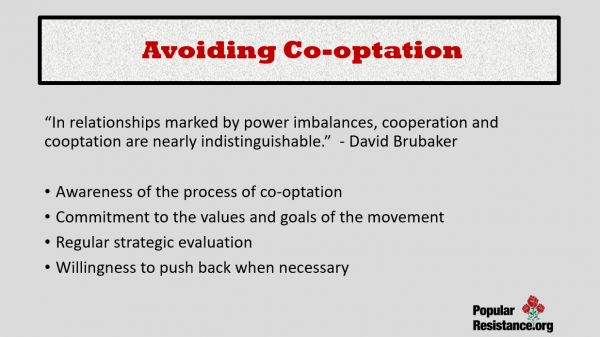 In considering opportunities for collaboration with the state or vested interests, movement actors would do well to mark the words of Dave Brubaker, a veteran mediator, “in relationships marked by power imbalances, cooperation and cooptation are nearly indistinguishable” (2003). That these processes appear so similar highlights the need for close analysis of partnerships and collaborative pilot projects like the one described at this article’s outset. 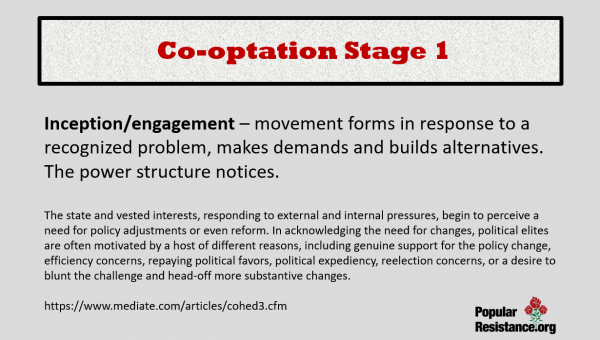 Our general study of social movements and our more detailed examination of the community mediation movement led us to develop this stage model of cooptation. 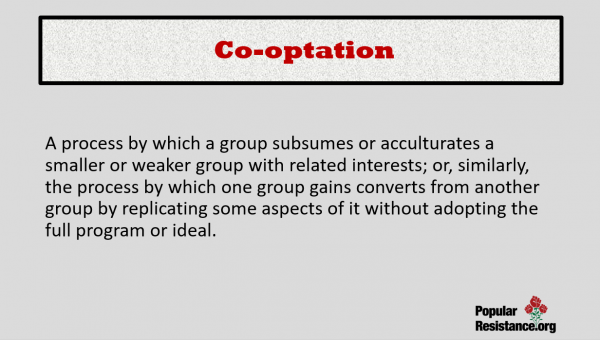 We have shown how and why a stage model of cooptation is reflective of key aspects of the community mediation experience in the United States. Other scholars studying similar processes in other movements may find that this stage model of cooptation is analytically useful in other contexts. Goldner (2001) has shown, for example, that the complementary and alternative medicine movement has undergone very similar pressures as those described here as it gradually gained acceptance within the traditional medical establishment. Mary Parker Follett (1924), who understood both the promise and the paradox of collaboration long before many others, wrote that “a fact out of relation is not a fact at all.” By dissecting the process of cooptation to its constitutive parts through a stage model with many discrete steps in each stage, movement activists may be better able to recognize the process as it evolves over time and to understand the significance of specific events and individual actions and decisions. To the degree that those movement activists can understand how particular actions relate to the larger whole, they are better able to make decisions that are more informed and more likely to honor their professed goals and values. Stratfor Monitors and Studies Social Movements, by Kevin Zeese, 2013. Here’s How Corporations Defeat Political Movements by Steve Horn, 2013. 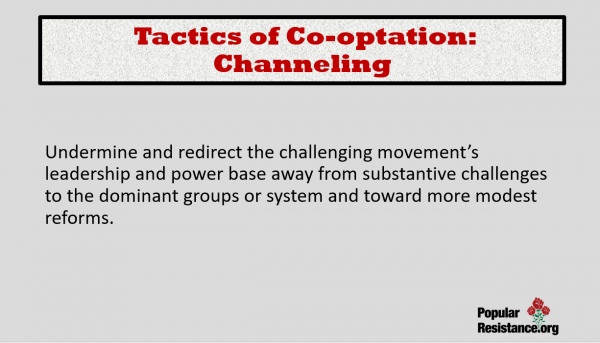 A Stage Model of Social Movement Co-optation by Patrick G. Coy and Tim Hedeen, 2007. The Sanders Campaign and the Left by Ashley Smith and Lance Selfa, 2016. The Democrats: A Critical History by Lance Selfa, Haymarket Books, 2012.